How Far is MSP Green Park? 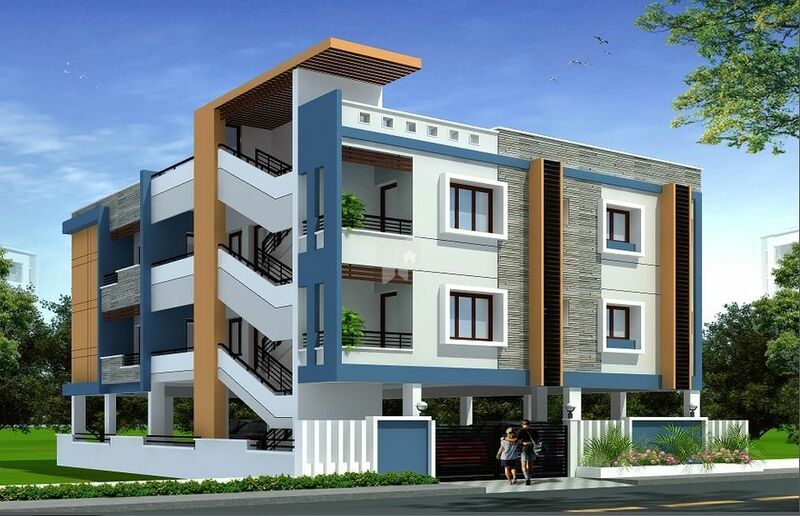 MSP Green Park, located in Chennai, is one of the residential developments of MSP Homes. It offers spacious 1BHK and 2BHK apartments. The project is well equipped with all the amenities to facilitate the needs of the residents. R.C.0 framed structure with RCC columns, beams and Slab. Brick Masonry walls with Plastering in CM. Covered Car Parking in Stilt floor with two floors. COLOUR, ELEVATION and DESIGNS as per Builder Choice. MAIN ENTRANCE door shall be provided with First class TEAK WOOD, frames and single leaf Masonite shutter, Godrejlequivalent lock, viewing lens, brass hinges, approved brass handles, tower bolts and necessary door stoppers. Bed room doors shall be of single leaf MASONITE shutter fixed to Second class TEAK WOOD frames. Bathroom doors shall he of single leaf shutters with laminatedlchemical painted flush doors fixed to Second class TEAK WOOD frames. WINDOW frames and shutters shall be with Second class TEAK WOOD, Glazed shutters and safety grills. VENTILATORS shall be provided with Second class TEAK WOOD frames, Glazed louvers with MS grill and provision for exhaust fan. Living, Dining and Bedrooms floorings shall be provided with 2'0" x 2'0" Vitrified tiles of standard brands (Basic cost of tile at Rs. 45.001 Sq. Ft.). Kitchen floorings shall be provided with 1'6" x 1'6" Anti skid Ceramic tiles of standard brands (Basic cost of tile at Rs. 35.001 Sq. Ft.). Kitchen platform shall be of high grade polished Black GRANITE top with half rounded edges (Basic cost of Granite at Rs. 120.001Sq. Ft.). Dado up to 2'0" height above the platform (Basic cost of tile at Rs. 30.001Sq. Ft.). Stainless Steel kitchen single bowl sink shall be provided with drain board. Chimney outlet pipeline will be provided. Separate pipe lines to sink shall he provided for Bore water and sump water. Water proofing to all toilets will use CeralFosroc chemical. One SUMP of adequate capacity for receiving Metro 1 Panchayath water as and when CMWSSB1 PANCHAVATH water supply becomes available to the complex. One OVER HEAD TANK of adequate capacity shall have Two compartments with provision for pumping water from captive source (bore well) or water from the ground sump. A Tap in the kitchen for Metrol Panchayath water supply from over head tank. 2 in 1 wall mixer Tap connections shall be provided in bathrooms with hygiene faucet with Overhead shower & Hot and cold water provision. All Internal plumbing water lines CPVC pipes and for External plumbing water lines PVC pipes are used. All PLUMBING fittings shall be provided with PARRYWARE I JAGUAR PVC & CPVC are Provided by Prince. All INTERNAL WALLS & CEILING shall be applied with Cement based Putty to have smooth surface and finally finished with one coat of acrylic primer and 2coats of premium EMULSION Asian paint. The EXTERNAL WALLS of the apartment 1 building shall be initially applied with 1 coat of white cement and finally finished with 2coats of weather proof EXTERIOR EMULSION. Entrance 1 Main door with varnish (sealer finishlMelamine finish). Compound wall be provided along the boundaries of the premises (only, when the premises is open from the other side), with M.S. gate as per the design & drawings. Paved drivewaylRamp will be provided as per the drawings. MCB I RCCB (Residual current circuit breaker) shall be provided with Havells,LEGARANDas per the choice of the Builder. Provision of ELECTRICAL points as listed in table below. One Bell point and One Light point (2 ways). Two Light points in wall, One Fan points at suitable location. One Light point in wall, One Fan & chimney points. Three 5 A pin point for Mixer, Aqua guard & Grinder. One light point & one 5 A Pin point over wash basin. One points for PumplMotor sets as per promoters' choice. One 5 A pin point in Stilt floor for Car washing (vacuum cleaners). ALL Electrical wire shall be of FINOLEX (ORBIT Make. Flat OWNERS Name Plate shall be provided at the entrance of the APARTMENT. Covered parking space for vehicles. Safety I Coverings will be provided for MOTORS. Fixed supports for drying clothes in terrace. Individual Mail Box at Stilt Lobby. 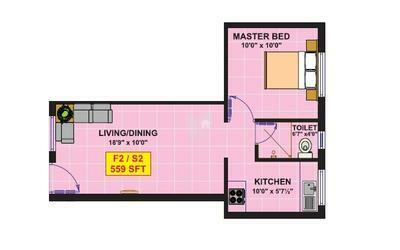 Two bed rooms shall be provided with lofts not exceeding 20sf t each. Steps are shall be provided GRANITE.